Ombre is definitely the keyword in the wedding industry in the year 2012. The word “ombre” is a French word which means shade. Ombre is the effect that colors melt into each other, into a color continium. The ombre effect can be applied to any aspect of a wedding, from ombre cakes, floral arrangement to wedding and bridesmaid dresses. If you are interested in this new trend, this article features some ombre centerpiece ideas to get you started with. 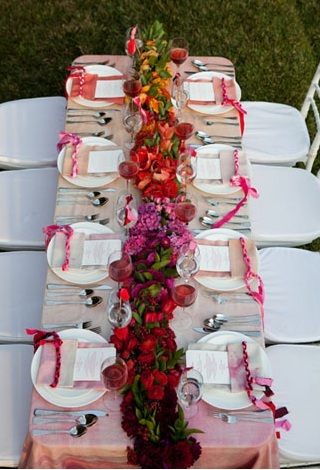 The ombre effect is the most beautiful in long centerpieces as there is more length to show the full color continium. So if you have long tables in your wedding reception site, you have a very good base for long ombre centerpieces. Even though long ombre centerpieces can be breathtakingly beautiful and glamorous, their price tags are also hefty as they require a big amount of flowers. If you don’t want to spend too much in centerpieces, you can also create the ombre effect in smaller round centerpieces. Pink wedding gowns - Be a princess in your wedding!